Summary: Hear the American Diabetes Association (ADA) recommended standards of care for children and adolescents, read why a family approach might be helpful for kids with type 1 diabetes, and see firsthand what it looks like to have a low blood sugar when you are on air. Read “Children and Adolescents: Standards of Medical Care in Diabetes—2018” at Diabetes Care. Read “The Family Approach to Diabetes Management: Theory Into Practice Toward the Development of a New Paradigm” at Diabetes Spectrum. 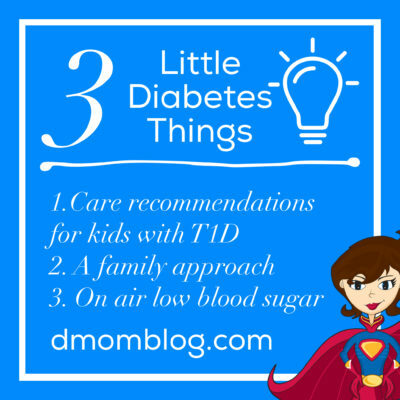 If you enjoyed these small bits of information, read more 3 Little Diabetes Things posts. Summary: Here are three topics which might not be comfortable for you: talking about diabetes and depression with adolescents, discussing diabetes openly, and the eating disorder diabulimia. Did you know that adolescents with diabetes (either type) are more likely to have depression than their peers that don’t have diabetes? Just think of all the diabetes-related stuff they have to deal with — blood sugar checks, highs and lows, having to give insulin before eating, etc. — that their friends don’t have to do. Plus high and low blood sugars can mess with emotions. Have you breached this subject with your teen? I know talking about depression is sometimes taboo, but this is an important conversation to have. Read “How to Talk About Diabetes & Depression with Adolescents” on diaTribe. Diabetes should be discussed openly and regularly within families. Read “The #1 Best Practice for Families with Type 1 Diabetes” on diaTribe. This may be a tough video to watch, but I highly encourage taking half an hour to learn about diabulimia. Diabulimia is an eating disorder where people with type 1 diabetes withhold insulin in order to lose weight. You’ll notice in the video that most of the people affected are young women and teens. Summary: Here are three articles in the September/October issue of Diabetes Forecast that I thought you might find interesting. First up is a tip given by yours truly about the low blood sugar kits I make each fall for school. 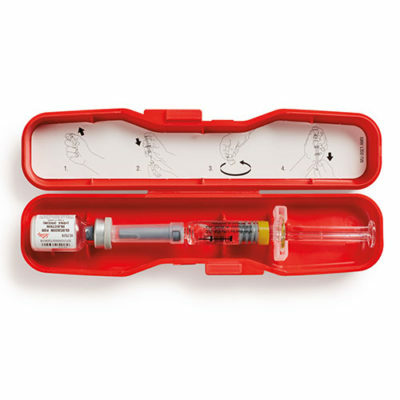 The second and third articles are about glucagon. 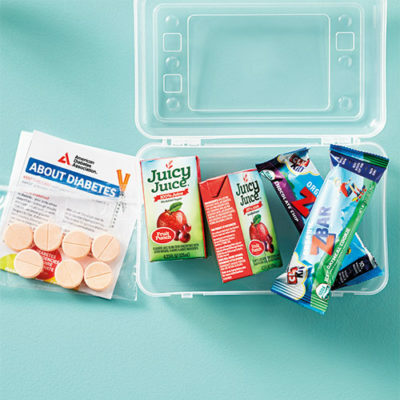 A writer from Diabetes Forecast asked if I would share a back-to-school hack and I told her about the low blood sugar kits that I make each August to place in my daughter’s classrooms so that she has easy access to supplies and doesn’t have to go wandering around the school in search of sugar or spend time in the nurse’s office. I love the graphic they created! Read “Diabetes Hacks for Keeping Organized This Fall” in Diabetes Forecast. The $100,000 question is how to make glucagon stable. 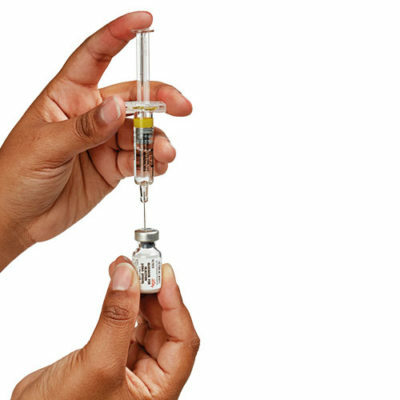 The current six-step process for mixing and injecting glucagon is not only too many steps, but that giant needle makes people who don’t usually see needles kind of frightened (i.e., the teachers that I train every year at school!). Wouldn’t it be awesome if there was an injectable pen similar to an EpiPen? Even if it somehow shot the liquid into the powder and mixed it before injecting. The great thing about the EpiPen is that it, too, has a big needle, but you never see it. Also, a future artificial/bionic pancreas system might have both insulin and glucagon. Stable glucagon would be needed for that to work. Read “New Easy-To-Use Glucagon Products Are Coming” in Diabetes Forecast. But, dude, seriously. Why are there so many steps involved in giving glucagon to someone? This article illustrates the six steps required to mix up and inject glucagon, but what it doesn’t say in step 4 is that it is completely impossible not to have giant air bubbles in the supplied syringe and if I can’t draw it up without having huge air bubbles when I am trying to demonstrate it to teachers, how in the heck am I supposed to draw it up without huge air bubbles in an actual frantic severe hypoglycemic event?! Read “How to Administer Glucagon” in Diabetes Forecast. Summary: Could a virus trigger the onset of celiac disease? Who should follow a gluten-free diet? 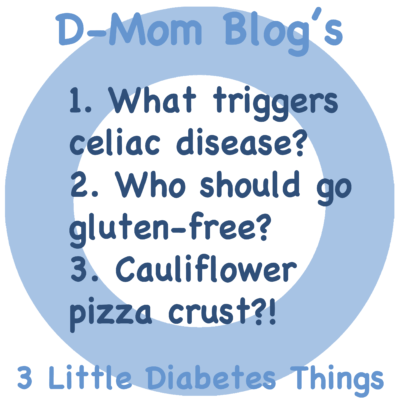 Have you tried cauliflower pizza crust? These are the three things I’m talking about this week. I’ve heard theories and seen research about the possible triggers of type 1 diabetes. Some suspect that a virus might trigger it. Here is research about a possible trigger of celiac disease. Stupid immune system! “It’s all about the timing,” Dermody says. The idea is that when the virus and gluten are introduced at the same time, the immune system mistakes the gluten-containing food as dangerous. Read “When Gluten Is The Villain, Could A Common Virus Be The Trigger?” on NPR. Who Really Needs to Be Gluten-Free? While the health consequences of celiac disease have been well documented, other reasons a person’s health might be improved by avoiding gluten include a sensitivity to gluten or something else in wheat (the major source of gluten in Western diets) and the placebo effect — a genuine benefit inspired by the belief that a chosen remedy actually works. Until evidence is developed that could justify screening the entire population for celiac, Dr. Murray advocates screening “everyone in the at-risk group,” which would include family members of celiac patients and everyone with Type 1 diabetes, premature osteoporosis and anemia, which may be signs of celiac disease. He also advised that people with chronic bloating, mouth ulcers, chronic headaches or fatigue should be tested. This is an interesting article about why people are or are not routinely screened for celiac disease. Since Q has type 1 diabetes, she has been screened through blood testing several times. Having some minor health issues, I have also been screened. Both of us were negative. It also discusses the risk of going gluten-free without a celiac diagnosis because you have to be eating gluten and symptomatic for particular tests to come back positive. 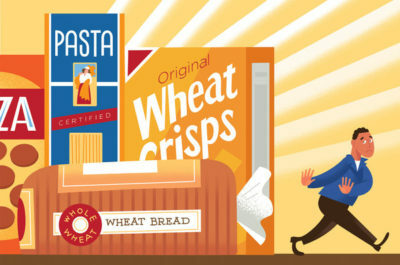 Read “Who Really Needs to Be Gluten-Free?” on the New York Times site. I know several people who swear by pizzas made with a cauliflower pizza crust because they are lower in carbs and because they can be made gluten-free. Trader Joe’s now has a frozen cauliflower pizza crust. Have you tried cauliflower crust yet? I haven’t. 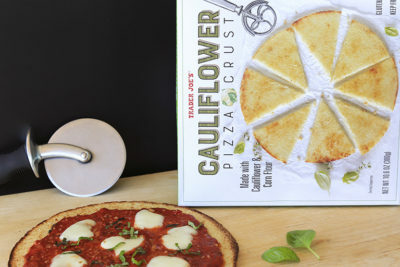 Read “Trader Joe’s has a new cauliflower pizza crust and we’re obsessed” on Today’s website. 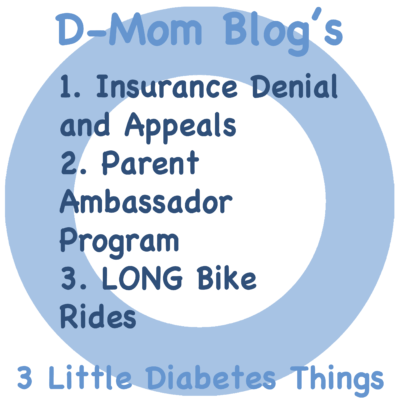 Summary: Insurance denials and the appeals process, College Diabetes Network’s Parent Ambassador Program, 20 T1D’s bike across the USA with Bike Beyond. I’ve learned not to take no for an answer, especially when it come to getting the supplies and medications we need to take care of our daughter’s type 1 diabetes. 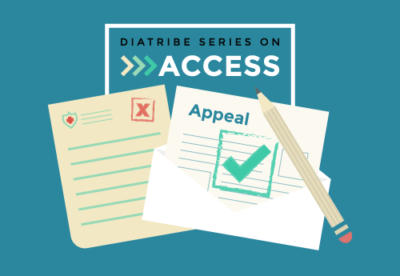 diaTribe has a great article on the process of appealing after you’ve been denied coverage. Read “When Insurance Gets Turned Down: Appeals Explained” on the diaTribe website. As Q gets older, she’s casting a wider and wider net of where she might like to attend college. Too bad she can’t live at home forever…safe in her own bed. Hopefully, wherever she ends up, she can find local support. The College Diabetes Network is launching a new program to connect college kids with local families who can support them in their diabetes. • Being there for a student whose family is not nearby in case of a diabetes-related emergency. Learn more about the Parent Ambassador Program on the College Diabetes Network website. 20 riders with type 1 diabetes are riding across America…they’re gonna need a whole lotta glucose tabs! 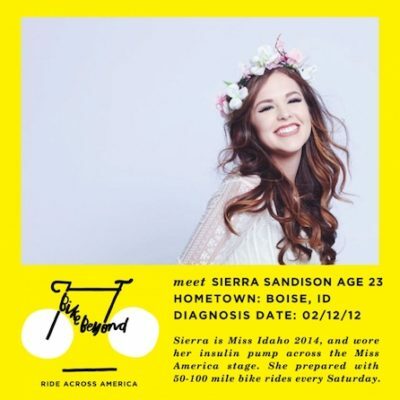 Riders include Sierra Sandison, who I’ve mentioned a few times. Find out more, including if they will be coming near you, on the Bike Beyond website. 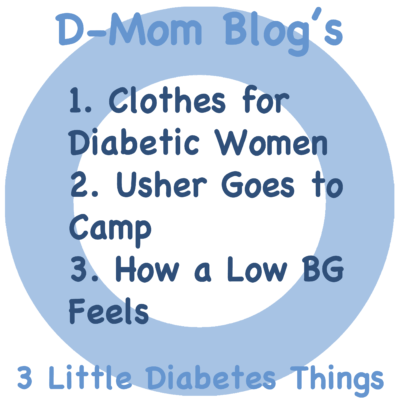 Summary: Clothes for diabetic women who need to inject insulin, Usher takes his son to diabetes camp, and how a low blood sugar feels. “You’ve heard of plus-size, tall and petite, but have you ever heard of clothes for women with diabetes? Click over to the BBC website to watch the video. Why Did Usher miss a recent benefit concert in London? Because he was dropping his son off at diabetes camp! Read the story on People’s website. So happy to see that last night’s concert in Manchester proved that love always prevails. I would have loved to be there but It was my son’s first day at Camp Kudzu, one of the few summer camps for kids living with diabetes. This was an important day for him and for myself as a proud father. Stay strong UK. Want some insight into how your child with type 1 diabetes may feel when having a low blood sugar? 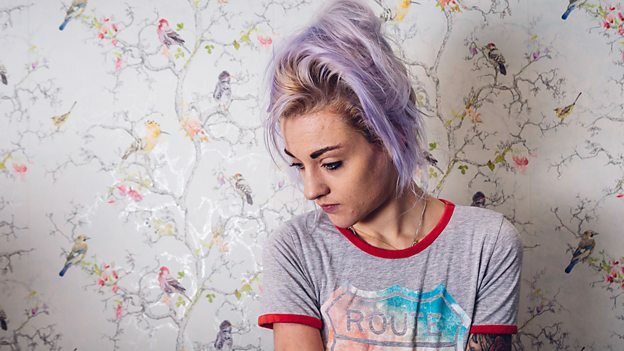 Watch these women describe what it feels like to them. More from Craig Stubing of the Beta Cell Podcast. The Deal With Lows from Craig Stubing on Vimeo.